Inventory count is a module used to aid in the counting of inventory quantities for individual or groups of inventory items. Counting inventory is an important part of keeping your system up to date and accurate with regard to quantities. Properly and regularly counting inventory helps keep costing, purchasing and materials forecasting accurate. Spire helps make this process efficient by allowing counts to be performed with a bar-code reader, or via entering counts manually. You can combine these methods, and Spire keeps track of count transactions, per item, as they are entered. 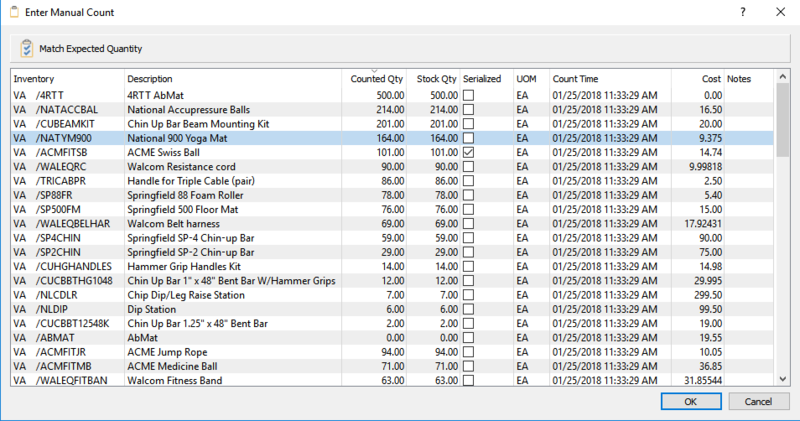 These transactions display values such as count quantity, the user who created the item count record and the date they entered the count quantity. 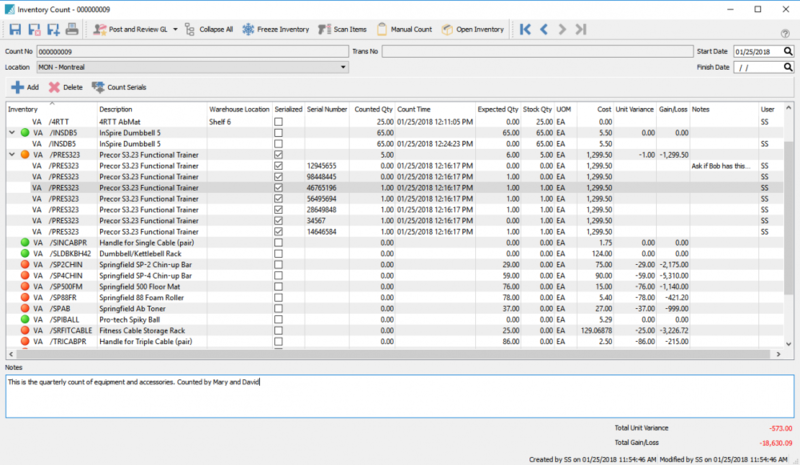 Spire supports counting in different units of measure, handles average costing and FIFO costing and posts adjusting General Ledger Journal Entries as necessary. Before counting inventory please note that it is critical that physical inventory quantities remain static (i.e. actual quantities of items on shelves and in bins). While you may continue to received purchase orders and invoice sales orders it is important that, at the point you “freeze inventory” that the physical inventory state matches the systems expected state of inventory. 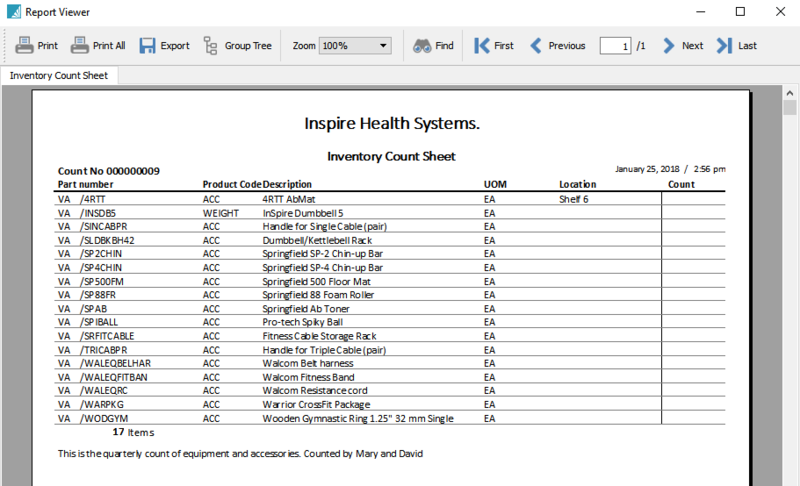 The result of an inventory count in Spire is to capture difference between the expected state of inventory and actual state of inventory. If inventory is physically removed AFTER a count process is started but BEFORE the item is counted, inaccuracies will result. Based on this, inventory counts should be accomplished as quickly as possible. Inventory count can be invoked from two areas. Trans No – The transaction number if the batch is posted. Select inventory to count by clicking on “Freeze Inventory”. Select the items that are to be counted. Choose either “Freeze All” which will add all filtered items to the batch, or choose “Freeze Selected” which will add selected items to the batch. Note that it is usual to count inventory in meaningful groups. You may wish to count in product code groups for example, and filter can be used to aid in this. 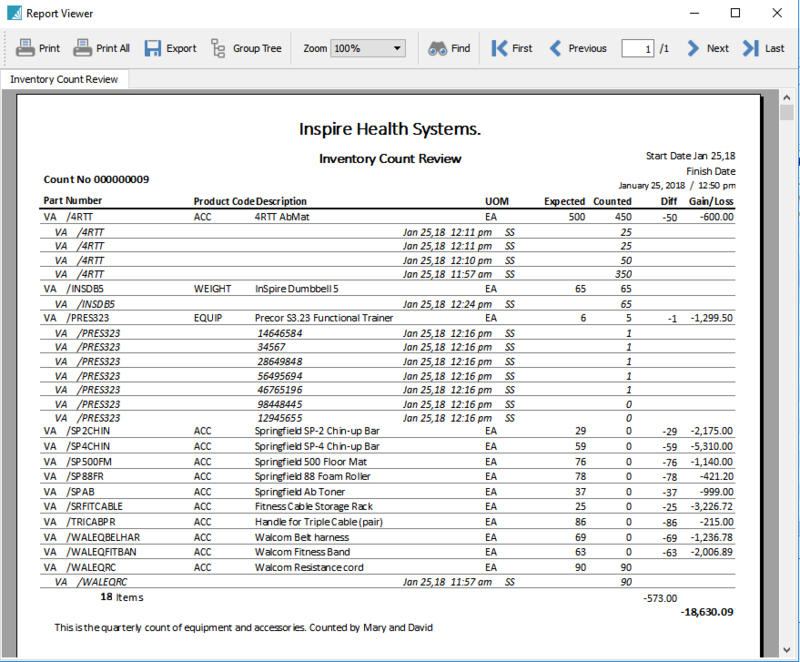 If using count sheets, click print and select report “Inventory Count Sheet”. Inventory count sheets are usually only necessary when counting inventory manually. Where possible it is much more efficient to count inventory by scanning items. To enter the counts select either scan, to scan bar codes of items, or click ‘Manual Count’. When you click manual count, the following screen is presented. Users can then enter the count manually or click “Match Expected Quantity” and the count will be populated with the on-hand quantity. Spire allows this because sometimes it is more efficient to edit the quantities that are wrong, rather than enter all of the count quantities separately. Click ‘OK’ to transfer the manual count to the batch. Note that when doing manual count, and when scanning that these processes are additive. This allows counts to be entered, for example, from different individuals manual count sheets. All these counts contribute to one overall count batch. This way if an count audit needs to be performed for an item it is easy to see who entered a particular item count quantity and when. When performing a manual count, the user can manually add serial numbers and edit each line. Experiment with how best to count inventory. When dealing with lot numbered and serialized items, manual count may be required, as Spire requires that you count not only quantities, but account for which serial number and which lot numbers are counted. Once all editing has been done the user can print an “Inventory Count Review” report (aka variance report). The unit and cost variance is always displayed on screen for ongoing reference purposes. The inventory count review report can be run many times throughout the course of an inventory count. An inventory count is only complete when it has been posted. The count can then be posted by clicking “Post” or “Post and Review” (depending on users setting) and the inventory count adjustments will be made and a journal entry will be posted to the General Ledger. The posted batch can be viewed at any time from the count batch list or from the General Ledger journal entry by clicking ‘View Source”. Any inventory count adjustments can also be seen from the inventory receipts tab of any affected item.